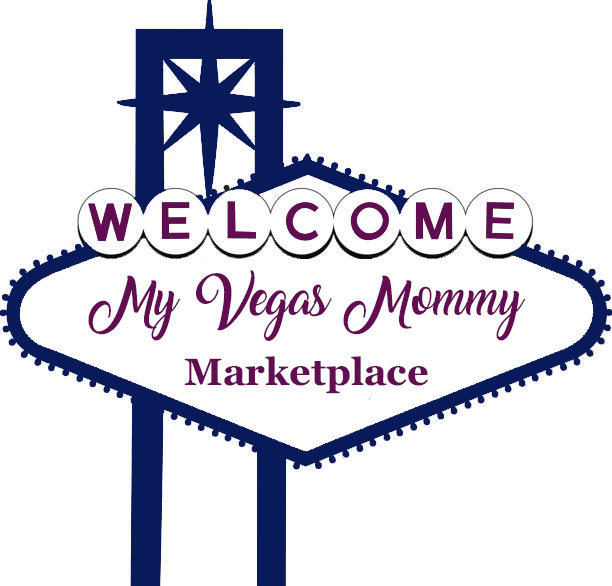 My Vegas Mommy: Treat Dad to Father's Day at Fleming's Steakhouse ~ A Steak Fit for Our Hero! Treat Dad to Father's Day at Fleming's Steakhouse ~ A Steak Fit for Our Hero! One word...TOMAHAWK! 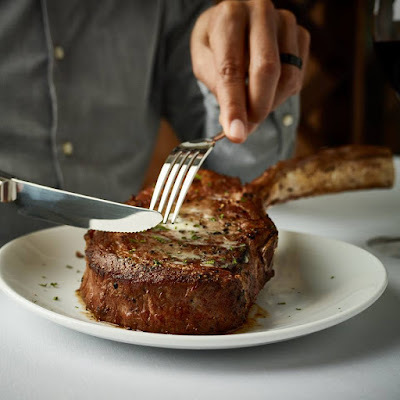 Now, most dad's love a good steak and Fleming's Prime Steakhouse & Wine Bar knows just how to treat dad on his special day. This weekend, June 15th-17th, Fleming's will feature a three-course menu with a legendary steak sure to please dad, the 35 oz. Prime Tomahawk accompanied by a salad course and dessert. This is a great value because the Tomahawk is normally priced $20 more on the main menu, so not only do you save $20, but also get 2 more courses. Fleming's is also offering a Bourbon Tasting Experience, for just $20, dad can sample Basil Hayden's, Buffalo Trace and Knob Creek. This was right up my husband's alley. He enjoyed sampling these and even got a small token to take home. In addition, on Sunday, June 17th, Fleming's will open at 10am and feature a Father's Day Brunch menu. 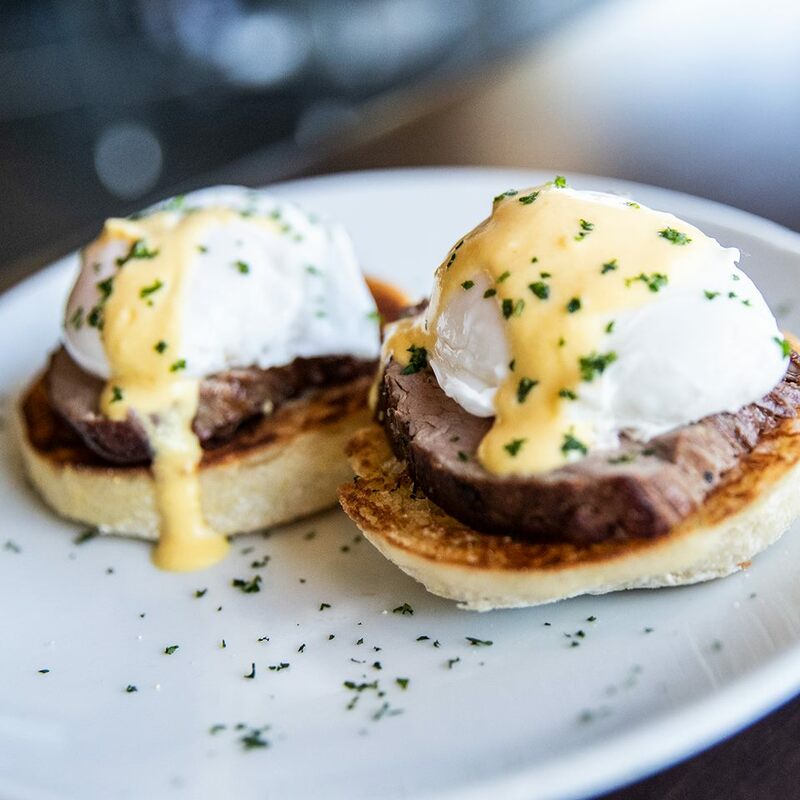 This three-course brunch menu, features delicious classics like Fleming’s Steak & Egg Scramble, featuring sliced filet mignon, blistered tomatoes and caramelized onions, served with a scramble of farm fresh eggs and vegetables. Order an appetizer, a side and get your choice of dessert from a selection all for $47. Dining with the kids? Fleming's children's menu is sure to offer them something to tickle their pallets from traditional mac & cheese to steak, they"ll be no need to leave them at home. And if you are joining in for brunch, there is a three-course children's brunch menu as well. 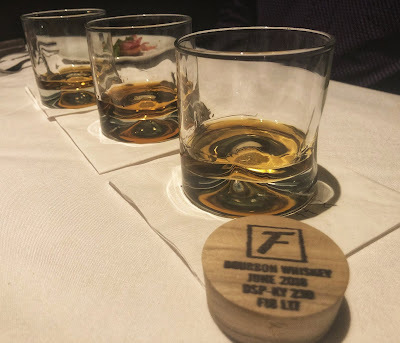 My husband and I celebrated our anniversary last Friday night at Fleming's and got a chance to taste this amazing menu for ourselves. For the salad course, we selected the Caesar Salad. There is just something about steakhouses that has me craving the caesar salad. You know their homemade dressing is going to be on point, the crispy cold romaine and the fattiness of the crumbled prosciutto was a great addition. It was delicious and perfect start to our meal. We also ordered the Housemade Burrata with Prosciutto, which is available on the brunch menu, and a half dozen of the Oysters on a Half Shell to start. The burrata was very creamy and cool; it paired nicely with the prosciutto on the crostini. I would recommend ordering this appetizer to accompany your meal. The main event was the 35 oz Prime Tomahawk and it did not disappoint. Served on a wooden cutting board, the steak was trimmed from the bone and sliced in front. The presentation will wow dad's carnivorous nature and his mouth will be watering from the minute he sets eyes on this bad boy. The steak was perfectly cooked to my husband's request and he said it was so juicy, you could tell the chef knew what he was doing with this cut of meat. They let the meat rest and the end result was a melt in your mouth steak fit for our hero. My husband and I both recommend also ordering the Yukon Gold Mashed Potatoes and Creamed Spinach, you cannot go wrong with those pairings. We also tasted the Crispy Brussels Sprouts with Bacon, it was delish! Save room for dessert, because this course is just as good as the previous ones. We recommend the Walnut Turtle Pie. It's walnuts, caramel and chocolate...what is not to love? Add the dollop of fresh cream offered, it gives it the coolness and dairy needed to cut through the sweetness. It is decadent. The main menu will also be available all day for those looking for something a bit different. I suggest the Colossal Cold Water King Crab Legs. They were huge, fresh and succulent. I do regret passing on the waiter, Julian's, suggestion though on ordering the Miso Glazed Chilean Sea Bass. I am definitely getting that next time! Visit FlemingsSteakhouse.com to make your Father’s Day reservations and give your oven a break, it's hot out!